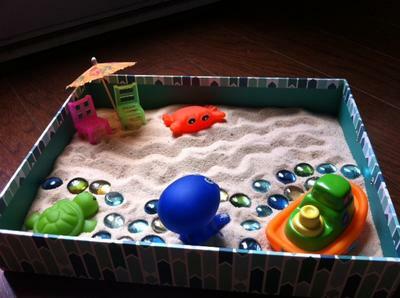 Because the sand tray therapy zen garden was supposed to be a source of relaxation, I did not hesitate to turn my garden into my happy place: the beach. I can not think of a more relaxing and calming environment for me than a beach where I feel sand between my toes and closing my eyes and drifting in and out of a light sleep while listening to the waves. Just the thought alone makes me happy. 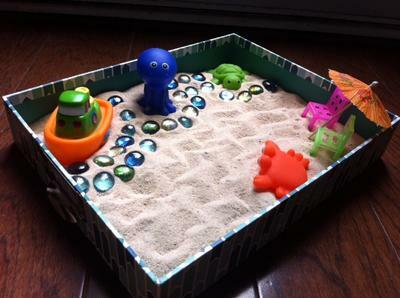 I used a filing box for my container, which is so fitting since I'm the queen and lover of office supplies, and filled it with the play sand that I purchased from home depot. The blue stones are leftovers from crafts that I have done in the past and represents the water where my turtle, octopus and my tiny boat "float" around. The umbrella is actually from a pino colada that I had during my trip to Mexico with my best friend last year. 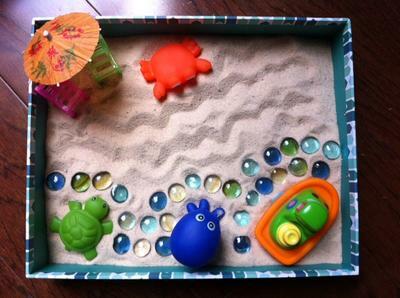 It was a very soothing experience to create my own sand tray therapy zen garden/beach and have even placed it in my room. I will most definitely be putting it to good use. I am even considering making one for my friends who are also in need of some zen-like moments during their hectic and stressful days.